August 1-August 3, a three-day event. The Savor South Sound beverage tasting event will feature five cideries on Thursday, August 1, eight breweries on Friday, August 2 and five wineries on Saturday, August 3. Tastings will run from 3 p.m. to 9 p.m. each day in the Heritage Hall Annex at the Thurston County Fair. Patrons must be 21 or over to enter the Savor South Sound event. August 3, 4 p.m.-8p.m. Community picnic in the heart of the Olympia, on Fifth Avenue in front of the Capital Theater, presented by the Thurston Food Systems Council. 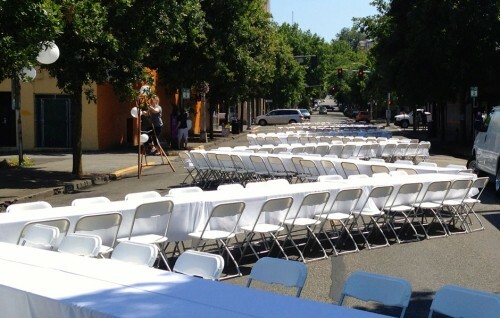 Join them at Olympia’s largest table and bring a picnic, plus plates and silverware to share with your friends and neighbors. August 3, 2 p.m.-4 p.m. The savory cuisine of Morocco. $65/person, includes recipes and instruction, lunch with a glass of wine, tax and gratuity. Call Jacqueline at 383.7000 to purchase tickets. August 24, 2 p.m.-4 p.m. Summertime grilling: fish; meats and vegetables, $65/person, includes recipes and instruction, lunch with a glass of wine, tax and gratuity. Call Jacqueline at 383.7000 to purchase tickets. August 4, 8 p.m. Showing of food justice themed film, The Real Dirt on Farmer John. It’s a bike-in movie, so bring your finest human-powered vehicle and enjoy the movie and discussion surrounded by the garden in full bloom. Hilltop Pop Shop will be there with their awesome bike-powered popsicle shop, selling locally made popsicles. Free. August 6, 6 p.m. Four course dinner paired with Bulleit Bourbon cocktails and prizes. $45/person, includes tax. Call 253-752-8899 to reserve. For each class, call 360-754-1448 to reserve. August 6, 6-8:30 p.m. Dinner on the Grill. $50/person. August 8, 6-8:30 p.m. All Fed Up Food Truck, $45/person. August 15, 6-8:30 p.m. Grilling with Barry Martin, $45/person. August 20, 6-8:30 p.m. A Posh Picnic, $45/person. August 27, 6-8:30 p.m. Kabobs, $45/person. August 11, 6:30 p.m.-8:30 p.m. Taught by Summer Bock of OlyKraut. Learn how to make raw sauerkraut and sample sauerkraut. Leave with recipes and instructional handouts. Register online. August 24, 5 p.m. A four-course dinner, plus passed appetizers, paired with white wines. Proceeds benefit Clover Park Technical College’s Culinary Arts Programs. Tickets are $95/person and must be purchased ahead of time. Purchase tickets online. August 24, noon to 4 p.m. Food, music, games for kids at the Gallucci Learning Garden Plaza. Free. August 25, 1 p.m.-5 p.m. Greet local farmers and connect with local businesses. Sample beer, wine and other fantastic treats. Take a self-guided tour of the store, learn what’s new in the co-op. Free. August 31, 5 p.m.-7 p.m. Picture 150 people dining at a jovial communal table under an elegantly appointed tent on Broadway. Chef Dustin Joseph will create a “Scratch American” upscale picnic to showcase local ingredients picked at the peak of the season. Broadway Sizzle will “Razzle Dazzle” you with lively entertainment, farm-fresh produce, craft brews, artisan cheeses, award-winning wines, and gourmet products of all kinds. Then, move into the gorgeous Pantages Theater for “All That Jazz”—the glorious national touring musical Chicago. Tickets for the dinner only are $75, or tickets to dinner and a B-tier seat to Chicago are $150. Get tickets online.